It’s another word for “conference”. In this case, it’s a congregation of quilters who will be gathering together to learn, observe, see amazing quilts, shop – of course, be inspired, converse and party. It is Austin, after all. I’m referring to QuiltCon. Are you going? Do you know what it is? Short version – QuiltCon is a modern quilt event, a conference and show created by and for The Modern Quilt Guild. Attendees come from all over the world to take classes from some of the top modern quilting instructors, see the exceptional modern quilts on display in the show and exhibits, and shop. 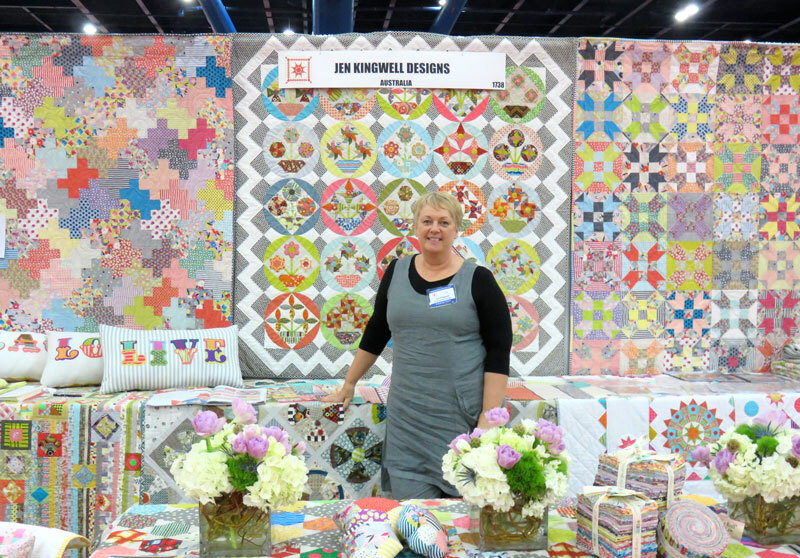 The first QuiltCon event was in 2013 and like this year’s event, it was held in Austin, Texas. Moda is going! We’ll be there with the Moda Bake Shop, several Moda designers and as a sponsor. 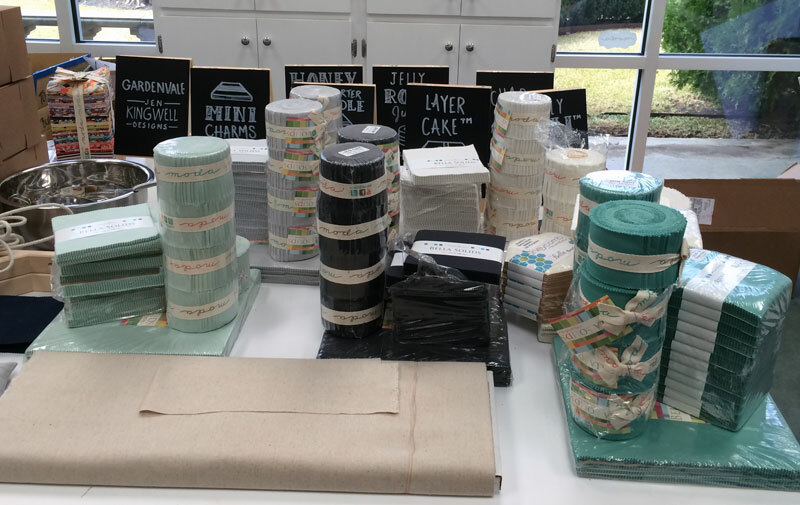 This is a “before” picture… Holly has finished contemplating the booth design and is now concentrating her efforts into turning this into the Moda Bake Shop booth in a couple of weeks. Jen Kingwell is coming all the way from Australia to be in Austin – she’ll be conveyed into the Bake Shop at least part of the time. I met Jen and Lucy in Pittsburgh last year, and we convened in Houston when she debuted Gardenvale. Lucy is Jen’s daughter and she runs Amitie Quilts in Gardenvale, Australia while Jen is living in United Arab Emirates. Everything you’ve heard about how congenial they are is true – times ten. Absolutely wonderful. The quilts are too. Jen’s new book won’t be available until March but she’s got terrific connections so I’ve got my fingers crossed that she’ll have a copy that we can peek into. Is there anything you’d like me to ask Jen? Vanessa Christenson – V & Co. – will be there too, she’s conducting a couple of classes. The first is on Triangles – half-triangle squares, flying geese, 60-degree triangles, paper-pieced triangles and wonky triangles. The second is using her signature ombres – how to use them and make them work in your quilts and projects. Of course they’re both sold out. I hope you’ll be there but if you can’t make it to Austin, I’ll take plenty of pictures. And I’ll stop using words that start with “con”. 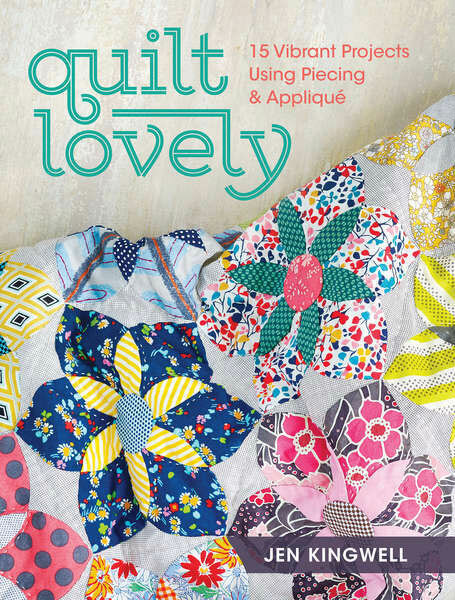 I love Jen Kingwell quilts…and have just purchased her Gypsy Wife pattern. Would love to know where she finds the inspiration for her incredibly unique quilt designs…(thanks). 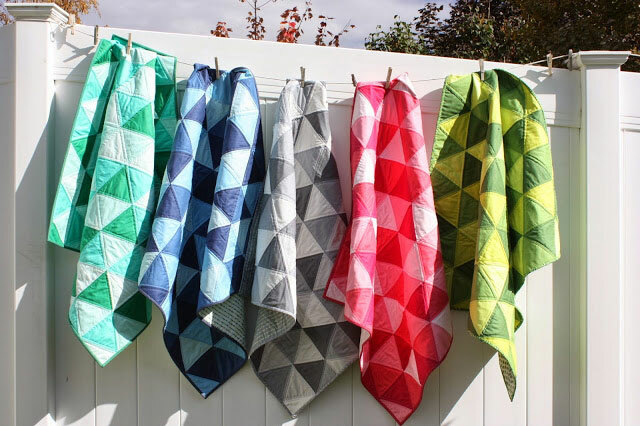 Are we going to be seeing some new Carrie Nelson quilts soon, too? I sure hope so!!! Hi Andrea, thanks so much for your support of my patterns. I hope you love making gypsy wife as much as I did. Love your blog posts. You’re doing a great job! I just read on Amitie’s website that Jen is moving back to Australia in March and that she’ll be teaching at the shop on Tuesdays! Those lucky Australian quilters. I used to read this blog a little bit but since you took it over it is a joy to read! See you there Carrie! and yes, i’ll be sure to stop by for my Moda Bake Shop goodie 😉 Can’t wait! Also, now that Quiltcon will be in different cities going forward, glad I’m catching it for my first time in Austin since the drive won’t be too bad. Great information about QuiltCon. Wishing everyone a great time. With fabulous Moda fabric and fabulous Moda Designers and fabulous Modarosie to keep us in the know, how could you not. Thanks for the Quiltcon information. Looking forward to the pictures. I love your blog. Can’t wait to see photos of the event. I would love to know about more events like this and how to attend,when they are,and where. Would love more ideas and info on small quilts using mini charm packs. I have enjoyed using some of your patterns. I’ll be at QuiltCon! And I get to take a class from Vanessa! I loved QuiltCon 2013. Hope to meet you there, Carrie! Live in Austin, planning on being there,new experience going to take the train downtown. Will be a great day. Sounds amazing, my heart is breaking!! You’ll have to have enough fun for all of us that are not going. I’ll be at QuiltCon! Hope to meet you while I’m there!!! I wish I was going this year but sadly have to miss it. I’ll be watching from the sidelines though.